The Roger Bacon Academy’s world-ranked archery team was featured in a statewide News 14 story on Tuesday evening, April 3rd. Due to the popularity of the current motion picture “The Hunger Games” and the lead character’s adept skill with a bow and arrow, the sport of archery is gaining recognition. News 14 reporter Amy Elliott contacted RBA because of the archery team’s success in state, national and world archery competitions. The Roger Bacon Academy has been training competitive archers for three years and the middle school team was ranked 7th in last year’s National Archery in Schools Program (NASP®) World Tournament. 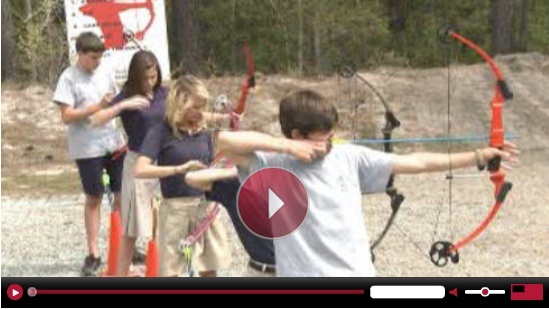 We are proud of our unique archery program and the students who have learned, along with shooting a bow, poise and confidence – even in front of a television camera. The team is competing for the NASP® North Carolina state title on Thursday, April 5th.